"Fusion isn’t Korean tacos," says Adam Schop, chef and partner of Nuela, a Latin American restaurant in the Flatiron district in New York City. 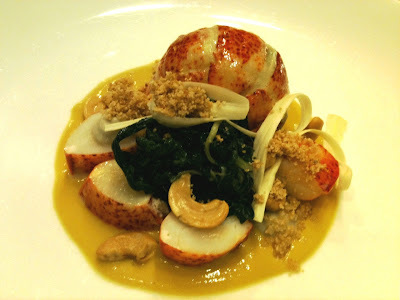 To Schop, simply mixing flavors together from different cultures is missing the point of fusion cuisine. He has embraced this philosophy at Nuela, where he focuses on flavors from such countries as Peru, Brazil, and Columbia, pulling from native influences and tastes from immigrant populations. Peru is Schop’s strongest focus, a country boasting a broad range of dishes heavily influenced by its large Japanese population. Schop visited the International Culinary Theater recently to share his philosophy with students and demo a few signature dishes from his restaurant. First up, a bright pink and orange Florida red snapper hit the cutting board and Schop quickly filleted it and sliced up tender pink cubes to create seviche tipico, the typical seviche served across Peru, and one of many served at the seviche bar at Nuela. Although you could technically make a seviche by marinating fish in citric acid and salt until it is cooked, there are a few integral steps that transform it from something acrid into something really special. 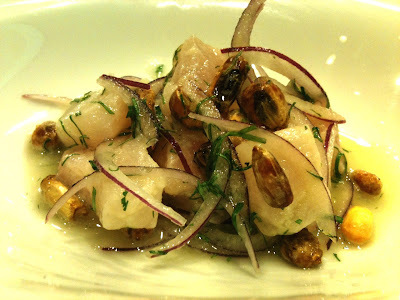 The secret to Nuela’s seviche tipico is something the Peruvian’s call leche de tigre, or tiger’s milk. It’s a natural liquor that leaches from the fish as it marinates, creating a salty, milky liquid that is often served alongside the ceviche as a shooter. Schop takes this principal and brings it to the next level by making his own leche de tigre base as a marinade for the fish, incorporating raw fish, celery, onion, garlic, and fresh ginger to create a savory green puree. The other key ingredient to his seviche is a custom blended citrus juice designed to replicate the flavors of Peruvian limes, which are larger versions of Key limes and pack a bold flavored juice unavailable here in the United States. 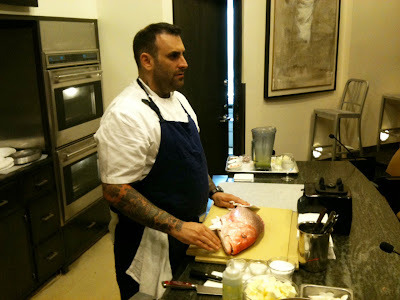 He uses a blend of Key limes, bitter orange, and yuzu to marinate his fish along with the leche de tigre and some salt to make one of the freshest, brightest tasting seviches I’ve ever tried. He tops the dish with red onion slivers, chopped cilantro, and cancha—sun-dried corn kernels fried in duck fat—to complete this classic dish. Students had the opportunity to not only watch and learn, but sample Schop’s seviche, along with a Brazilian-influenced lobster moqueca with hearts of palm, Swiss chard, farofa, and cashews, and the show stopping, duck-focused dish, aroz con pato (shown below). 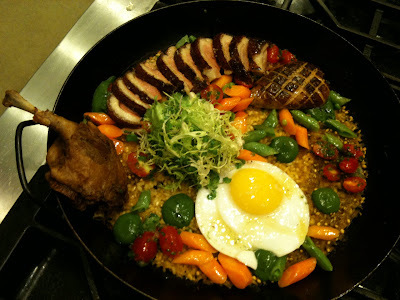 Awarded the distinction of Sam Sifton’s Best of Dishes of 2010 by the New York Times, the aroz con pato is a paella topped with seasonal veggies, foie gras, dry-aged seared duck breast, duck confit, a fried duck egg, and a duck gizzard salad to make a feast for two (or three, or four…). Don’t forget to check the events calendar to stay up to date on the exciting demos coming to the International Culinary Theater; students and alumni are invited to taste and learn! Tara O’Keeffe graduated from the evening Classic Culinary Arts program on March 16, 2011. After an exciting year learning how to make food look and sound good at the Food Network and Food Arts magazine, she has come back to FCI to share and expand her passion for food, working in the Culinary Programming department. She has a blog called Fun Fearless Foodie.